Cardiff City footballer Ivor Allchurch in training. 17th April 1964. Image courtesy of Mirrorpix. As the ‘Golden Boy of Welsh Soccer’ Ivor Allchurch enjoyed a long and distinguished career. As a skilful inside-forward he thrilled crowds with his wide range of passing, a hypnotic body swerve and deadly shooting. Joining Swansea City in 1947, he went on to play until 1968 with Newcastle United and Cardiff City before re-joining Swansea. In 691 league games he scored 249 goals including 17 hat-tricks. In 1966 he received an MBE for services to football. For Wales, he was a key part of a golden generation who went to the World Cup finals in 1958. He scored 23 goals in 68 games and his number of caps was a record until 1986. 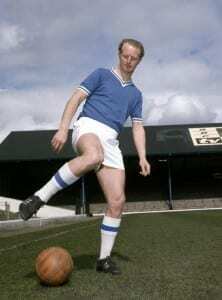 Although retiring from league football in 1968 at the age of 38, Allchurch continued playing in non-league and local football until his fiftieth year. A statue of Allchurch now stands outside Swansea City’s Liberty Stadium, following his passing in 1997.